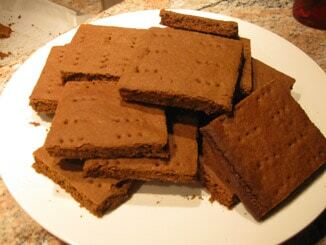 Graham Crackers are simple cookies that go well with so many things, like peanut or almond butter, jelly or just plain dipped in tea. But the best thing to do with them is to make S’mores. Preheat oven to 350oF. Line a baking sheet with parchment paper. In a large bowl mix together flours, starch, sugar, baking soda, cinnamon and salt. In a medium size bowl put the oil, nondairy milk, molasses, and vanilla. Using a hand mixer or fork, cream the oil with the other liquid ingredients. Pour the wet mixture into the large bowl with the flours and mix well, kneading to form a smooth dough. The dough should be moist, but not sticky. Line a work surface with parchment paper. Lightly dust with additional flour (any of the above three will be fine). Place the dough on the parchment and work into a rectangle using your hands and a rolling pin. Make a rectangle that is about 1/8 inch thick. With a paring knife or pizza dough cutter trim the edges making all the sides even. Cut the dough into thirds or quarters lengthwise and then into thirds or quarters width-wise. Transfer the crackers on the parchment paper to a baking sheet. Score each cookie with a fork 3 or 4 times in 2 columns. Bake for 14 minutes. Remove from oven and cool completely on the baking sheet.